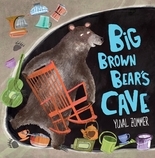 Big Brown Bear finds a lovely new home, a dark and empty cave just right for a bear. Then one day he wanders into the city and discovers that humans also have caves, which they call garages and fill with all sorts of stuff! Bear decides he must do the same — but soon there is no room in his cave to stretch or scratch or do any of the things that Big Brown Bear likes to do, including seeing his friends. Maybe it’s time for all the stuff to go! What will Bear do when he fills his cave so full of stuff that there’s no room at all — even for his friends? 32 / 10 1/4" x 10 1/4"
Yuval Zommer graduated from the Royal College of Art and has worked as a creative director for some of the world’s top advertising agencies. He lives in England.